Thank you for your interest in Ayuda. Ayuda is a nonprofit animal welfare program. We are committed to the health and well-being of dogs and cats. Our territory is the Lake Atitlan region in the Guatemalan Highlands. Operating as a team comprised 100% of unpaid volunteers, we work together in the names of compassion and care in a land where animal control has a history of being handled by semi-annual public poisonings. Ayuda has no overhead and only 4% of our donations cover our minimal administrative expenses. Our work is funded through grants and by people like you who care about the plight of helpless animals. Your donations truly go to animal care. 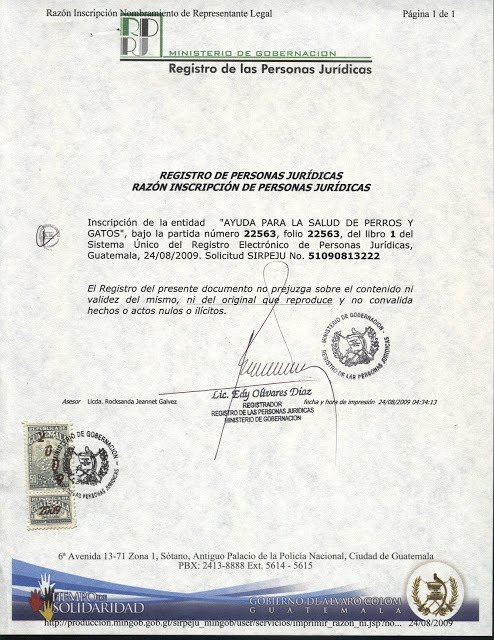 DUE DILIGENCE: As an officially registered Guatemalan non-profit Asociación, the design of the Ayuda program is based on an extreme over-population of domestic animals, and caring citizens, businesses, schools, local and national government agencies, and other nonprofit organizations which share our philosophies and goals. POPULATION CONTROL: Ayuda facilitates professional spay/neuter sterilization services for needy dogs and cats. As part of our standard treatments, we also provide for vaccinations against deadly local diseases such as Parvo and Distemper, along with internal and external parasite treatments. Our weekly sterilization clinics are generally scheduled on Thursdays. Currently, we routinely facilitate clinics in 4 major villages and their aldeas. Impoverished locals and local rescuers are welcome to bring animals to any of our clinics. AYUDA INTERNSHIP PROGRAM: In 2013 Ayuda received a seed grant from the Darlena Lake Foundation to initiate an internship program to develop a cadre of humanely educated Guatemalan veterinarians who will support sterilization efforts now and into the future. The program is open solely to final year vet students from the University San Carlos, School of Veterinary Medicine. Students are required to complete a 6-month, hands-on internship under the tutelage of a licensed Guatemalan veterinarian prior to receiving their diploma. DAY-TO-DAY ACTIVITIES: On a daily basis, roaming dogs and cats are caught, treated, and released to and from their daily habitats. In addition to sterilizations and vaccinations, we provide hands-on treatments for parasites and other ailments such as mange, malnutrition and even cancer. Generally, our pre/post-op care and treatments are provided hands-on by Ayuda volunteers. These treatments are typically performed in open public areas or in the homes of our neighbors. Through simple but effective health care measures, and with no more confinement than absolutely needed, we have seen remarkable recoveries and positive measurable results in many roaming animals who were sick and dieing when we first discovered them. VETERINARIAN SERVICES AND SUPPLIES: Ayuda partners with qualified professional Guatemalan veterinarians for sterilizations and other health care needs. Veterinarian services, medical supplies, hospitalizations, and all other professional services are paid by Ayuda on a pay-as-you-go basis. HUMANE EDUCATION: We have found that the best humane education takes place during our open-to-the- public sterilization clinics as well as through our daily work in the neighborhoods. Ayuda interns and volunteers often educate curious passerbys (especially children) about the purpose of the hands-on humane things we do with the animals on their streets and sidewalks. Ayuda interns provide presentations in local schools, to municipal employees, and the general public in which attendees are taught about the issues of over-population, cruelty, compassion, and survey techniques. Additionally, interns conduct radio and local television call-in shows to answer general questions from the public. FOSTERING AND ADOPTIONS: Our volunteers provide in-home foster care for animals requiring extended health care treatments, such as chemotherapy, as well as pre-adoption services for as many as possible until loving permanent homes can be found. VOLUNTEERS: We eagerly and gratefully welcome volunteers (especially vets and vet students), as well as in-kind donations of supplies brought to us by visitors, and all other locals and visitors who care to help the plight of an over-population of neglected street animals. MUCHAS GRACIAS: The daily lives we experience in impoverished communities overwrought with health issues have lead us to take stands of commitment for animals and humans alike–but especially in the names of civility and compassion for helpless animals. The Guatemalan Highlands have a very high population of homeless, starving, and endangered dogs and cats. We do what we can to prevent their deaths, and offer them health care and human kindness. And we need help. In Spanish, ayuda means “help”. Thank you for helping Ayuda to continue its help for the helpless. Thank you very much for including Ayuda! How did you find us? Thank you for getting in touch with us. Please look for a personal email to set up a time and place to meet.